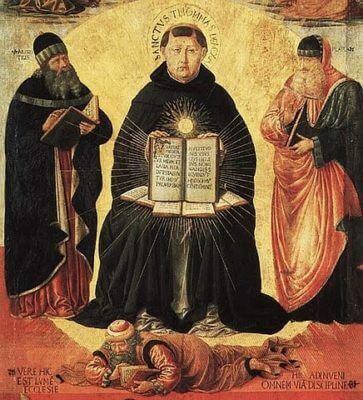 Saint Thomas Aquinas, Priest and Doctor - My Catholic Life! The silhouette of St. Thomas Aquinas stands like a giant on the highest summit of human thought, casting such a wide and deep shadow over the surrounding landscape that all subsequent thinkers labor in the shade on the slopes below him. 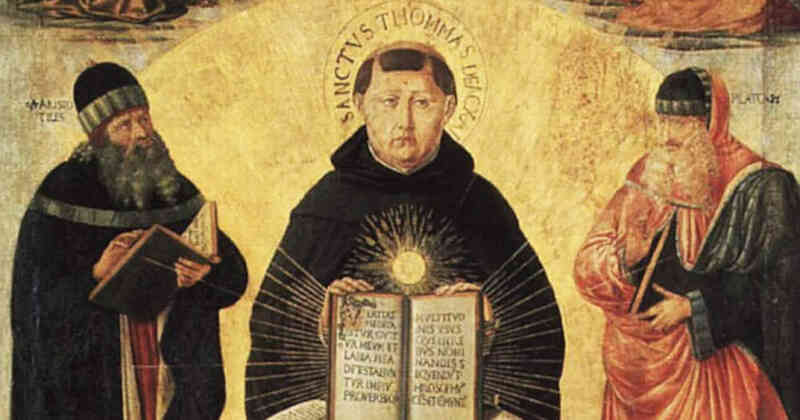 It is fair to say that Thomism, the thinking method and intellectual conclusions of St. Thomas, has been the Catholic Church’s standard theology since he lived in the thirteenth century. St. Thomas understood that all thinking about God is done from inside original sin and within the parameters of human intellectual capacity. The uncreated, timeless, mysterious God, then, is by definition incomprehensible to creatures trapped in time, space, matter, sin, distraction, and confusion. God is outside of the universe, rather than being just one important ingredient in the recipe of reality. This essential “otherness” of God means that His presence is not completely accessible to the senses. It is not just a question of seeing farther, understanding more deeply, hearing more acutely, or feeling more intensely. Twenty senses instead of five would still not be enough to capture God because He transcends all other forms of being known to us. In the 1950’s, a Russian cosmonaut looked out over space from his orbit miles above the earth and declared “I have found no God.” He was looking for something that wasn’t there and answering a question that was poorly posed. Sometimes God is described as the highest being in an immense hierarchy of beings. From this perspective, the tiniest specks of organic or inorganic life, up and onward through plant and animal life, mankind, the planets and the solar system itself, are all beneath, and owe their creation to, the super being of God Himself. In this “ladder of existence” understanding, every being is a rung leading to higher and higher rungs at the top of which stands God. St. Thomas clarified that this approach was inaccurate. God is not the highest of all beings but being itself. Every person at one time did not exist. Creation itself, including mankind, is created, meaning at some point it was not. But God cannot not be. For St. Thomas, God’s essential action is to exist. It is intrinsic to His nature as God. God, then, is not something in the air, but the air itself. He is not the biggest whale in the ocean. He is the water. This means that there is no strict need to provide scientific evidence for God because even asking the question presumes the reality all around us. In other words, science can explain the chemical composition of ink, but science has nothing to say about the meaning of words printed with ink on a page. This does not mean science is undeveloped, but just that it has limits. Thomism’s understanding of God as non contingent being itself which makes all dependent existence possible is intellectually sophisticated and also deeply attractive. This understanding of God meshes nicely with an appreciation for the natural beauty of the earth, love of art, and charity for our fellow man, while also allowing space for God to reveal Himself more fully, and gratuitously, in the person of His Son Jesus Christ. St. Thomas’s encyclopedic knowledge and massive erudition existed harmoniously with a humble nature and a simple, traditional Catholic piety. He was a well-balanced man and a dedicated Dominican priest. This synthesis of childlike wonder and deep inquiry marked his life. After having a mystical vision of Jesus Christ on the cross while praying after Mass one day, he abandoned any further writing. He died on his way to the Second Council of Lyon in 1274, not yet 50 years old. He is buried in Toulouse, France, retaining his status as the Church’s most eminent theologian. St. Thomas, your life of the mind co-existed with a deep piety. Your writings defend the faith of those who have neither the time nor the gift for higher study. Help all those who teach in the Church to follow your example of humble and faithful inquiry into the highest truths.